In response to action brought by the animal rights organisation Karuna Society for Animals and Nature, India’s Supreme Court has agreed to consider a total ban on plastics consumption in the country of more than 1.2 bn people. The court has called on Indian states to express their views on a possible ban. To avoid such action, it also urged that the plastics industry collect and recycle the waste. Karuna said it is concerned about animals ingesting the plastics, in particular discarded bags made of polyethylene. 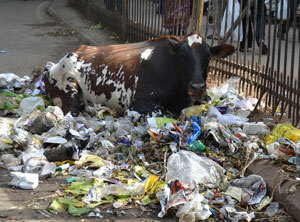 It points to tests on 36 cows that it said found 32-50 kg of plastic bags in each animal’s stomach. The court expressed its support for the organisation’s campaign, which is being promoted by the television channel NDTV. “Our urban areas are getting choked with plastics,” the judges remarked, adding that “until we examine the total ban on plastic and ensure the collection and disposal of all plastic, the next generation will be faced with a ticking atom bomb.” An estimated 1 bn plastic drinking water bottles are manufactured in India every day. According to Indian news reports, recycling is largely in the hands of waste-picking slum dwellers who earn a few coins for every bottle they pick up. This year’s fourth edition of the “NDTV-Toyota Greenathon,” a 12-hour telethon to be held on 20 May, will focus on a plastic clean-up drive in Agra. The activists also will attempt to discourage the use and incorrect disposal of plastic bags.